Contegra’s STATION MASTER 702 controller is an Easy-to-See and Easy-to-Set (EZ2 See/EZ2 Set™) automatic duplex pump control and alarm monitoring system that provides duplex pump control with an intuitive, easy-to-use graphical user interface. 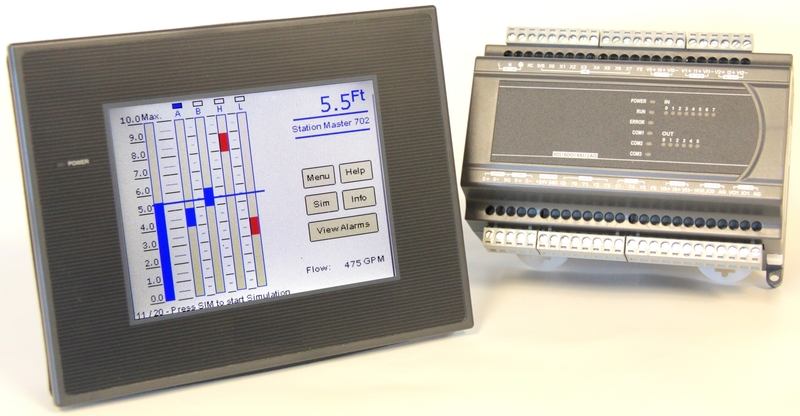 The STATION MASTER 702 controller is ideal for sewage lift stations (i.e. Pump-Down applications) or water systems (i.e. Pump-Up applications). The EZ2 See/EZ2 Set™ interface makes installation and operation a simple process. The graphical display shows the current tank level, pump 1 and 2 on/off setpoints, and the high and low alarm setpoints. The DIN-rail-mounted IO Module is typically mounted on an enclosure’s inner panel. The module’s relay outputs provide control for the two pumps, and four user-selectable alarm outputs. The module’s selectable inputs include pump running, pump unavailable, pump flow, control inhibit, external alarm acknowledge, pump over-temperature, pump seal-failure, generator running, and alarm acknowledge . The IO Module’s 12-bit analog inputs accept both a primary and secondary (optional) process level sensing input and an analog signal for a flow sensor (optional). The SM702V provides VFD control by means of an analog outputs which is used to modulate the VFD’s speed . The controller’s second analog output follows the process level over a 0-100% excursion. The controller accepts analog inputs ranging from 4-20 mADC or 0-5 VDC. The Station Master 702 controller is able to easily scale either a calibrated (i.e. 4-20 mADC over 0-10’ excursion) or an uncalibrated input . Whether dealing with a new installation or retrofitting an existing site, the Station Mater 702 controller provides outstanding control and alarm capabilities. The installing technician sets the controller’s operating range to a value of up to 100.0’. The Station Master 702 has an on-board audible alarm and four user-selectable alarm outputs. The Station Master 702’s inputs may be configured as either sinking (i.e. Pull down) or sourcing (i.e. Pull-Up). Selectable Discrete Inputs: Pump 1/2 Running, Pump 1/2 Failed, external alarm acknowledge and controller inhibit. Discrete Relay Outputs: Pump 1 & Pump 2 Control, and four user-selectable alarm outputs. All relay outputs are normally open (i.e. open on power failure). Outputs 1-4 share a common return. Outputs 5 & 6 share a second common return. The relays are rated for 2 amps maximum per contact and a maximum of 5 amps per common. The SM702 includes the serial communication cable that provides communication between the HMI and the IO Module.